I have used titanium add a backing for my plique a jour on fine silver. I have stoned the back and then flash fired but still have a film on the enamels where they were in contact with the titanium. It looks like titanium and refuses to budge. Next port of call is the dremel and grinder under water. Vivien, if you can take a photo it would help me know better. I will be traveling the next week but will check in to see if you have posted again. 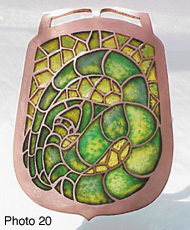 – If enamel does not adhere to copper, how do you get it to fuse to the pendant? Thanks Bongo, Yes,the link is broken. GOM is not online at the moment and as soon as they are back up the will be repaired. To answer your question the enamel in plique a jour is inside the cells and will not fall out. If you were to enamel on copper foil or try plique on copper foil, when complete you gentle peel the foil backing off. Another solution is to use lyre-fire solution added to your enamel, 1 part klyre-fire 5 parts distilled water. And float the enamels in the cell. Thanks for the links, hints and great advice. The tutorial with copper foil as a backing worked well with a copper piece as long as I was diligent in cleaning up the cutouts and used the same care with firescale cleanup between torch firings. I tried the copper foil with .999 silver piece and managed to get it so hot that the foil fused with (alloyed with?) the silver…I broke the glass attempting (unsuccessfully) to get the foil off. I will try the titanium backing with the silver next – and maybe attempt to exercise a little more torch temp control at the same time. Sounds interesting. I use a kiln to have more temp. control. Just bring the torch up very slowly and you will see the enamel melt.